I think the last time I posted that the sun was out was last Sunday. It was a long week but I do think (hope) that spring is here. It's sunny and we are lucky that the annoying tourist neighbours chose not to come up this weekend, so no loud noise coming from next door! I'm enjoying the day on the porch! Charlie and I are happy again! :) I'm glad Charlie seems to be coming out of her depression, but she's still being extremely picky about her eating. I made her some plain rice this morning and she gobbled it up after not having a bite of anything for a day and a half. She gets like this as the seasons change. We've looked up husky behaviour and also talked to others who have huskies and they also have trouble with their dog's appetites a few times a year, so we're not going to worry too much since she's otherwise healthy as a horse! Tomorrow it's supposed to go up to about 17 degrees C, so I'm hoping most of this snow will have melted. 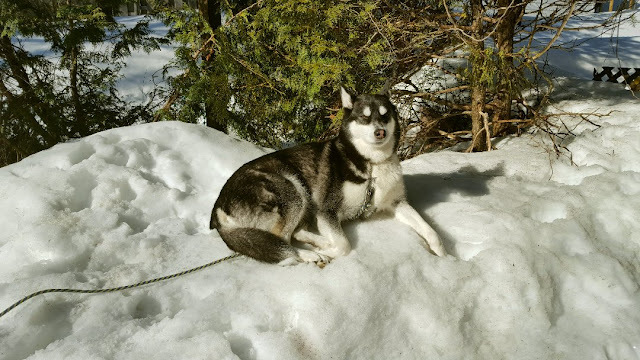 The huskies have been outside for a few hours with me now, happily taking sun naps in the snow and now and then trying to chase a little brown squirrel that is simply teasing them! Jack is more of a porch-man. He sticks with me mostly! This is a good view of the backyard porch, it's really tiny but I make the most of it. Last summer I had my porch swing up there and we could barely get in the door, but I was definitely comfy up there! Soon we'll be screening it in. I saw a few flies out this morning! 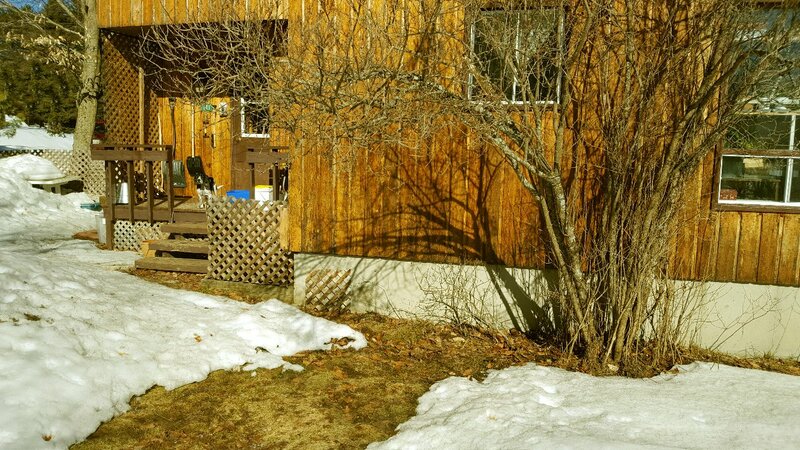 The window to the right of the lilac tree is where I have my window garden, it's getting some much needed sun today too! If I close my eyes and really pay attention, I can hear the songs of chickadees, crows, pigeons (they live in the belfry of the church), Mourning Doves (my favourite! ), grackles, Blue Jays, woodpeckers and red-winged black birds. I love living in the mountains!! I'm seeing more and more of the yard coming out...this is where most of my veggies will be, right by the house where they get the most sun. I'm now reconsidering containers and thinking more of raised beds...there are way too many roots over in that area to dig up so I thought containers would be best. But now I'm thinking four seasons, and I would like to transform the raised beds into cold frames come autumn. Last night was pizza night. We always make two and have leftovers for lunch the next day. The first one was apricot jam, prosciutto and Blue cheese...sprinkled with a nice Balsamic vinegar at the end. WOW. The last time we made this we used fig jam, but it was so sweet! We also wanted to try freezing the prosciutto, which is apparently taboo! It freezes fine but we'd only use it for cooking because it gets too chewy. Delicious. 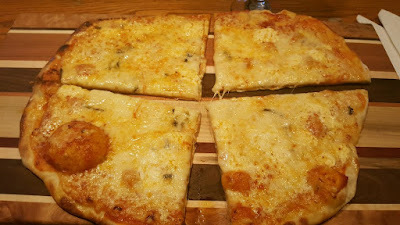 The second pizza was four cheese: pizza sauce, Mozz, Parm, Blue and goat. What a great meal! This was all the cheese I'd bought on March 6th, and I still have so much left. This week I'll be planning for my monthly shopping trip which will be April 17th. I might not spend as much as usual, because we have so much food still! 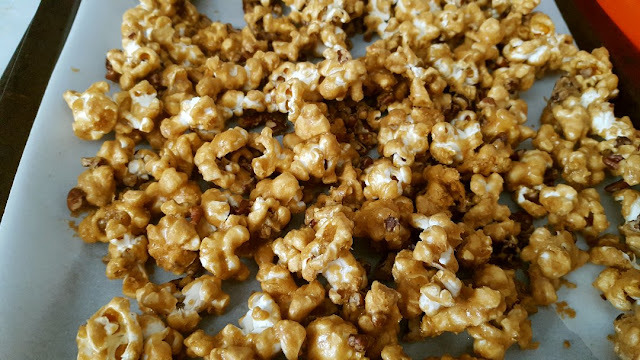 I made more Cracker Jacks too, they are so addictive. We didn't have pecans this time around, they are kind of expensive! So it just became caramel corn I guess. We brought this to bed after dinner and watched Mel Brooks' "Dracula: Dead and Loving It"...we both fell asleep 10 minutes before it ended though! The pizza looks and sounds delicious. Do you use a bread machine for the dough or the traditional way? When we do make it is with the bread maker and that has made it much less of a chore and much more available as a meal. Hi TB :) I used to have a bread machine a while back but it stopped working after a few years, of course, it was a discount store purchase...no quality there. I just never replaced it. It was so handy for pizza dough I agree. I make all doughs by hand now. Sometimes I struggle because I have this mystery hand/knuckle pain and kneading dough for 10 minutes hurts. Other times I find it really therapeutic! I love the whole process of making things from scratch though. 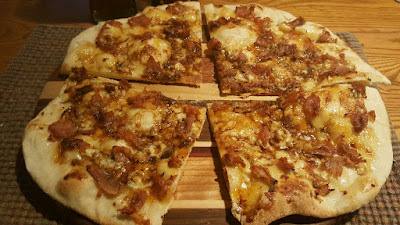 Both pizzas were so good, I was craving the prosciutto one all morning! Salty and sweet was a great mix! I have your recipe for pizza dough although I haven't made it yet. It sounds perfect for us because we both like a thin dough. 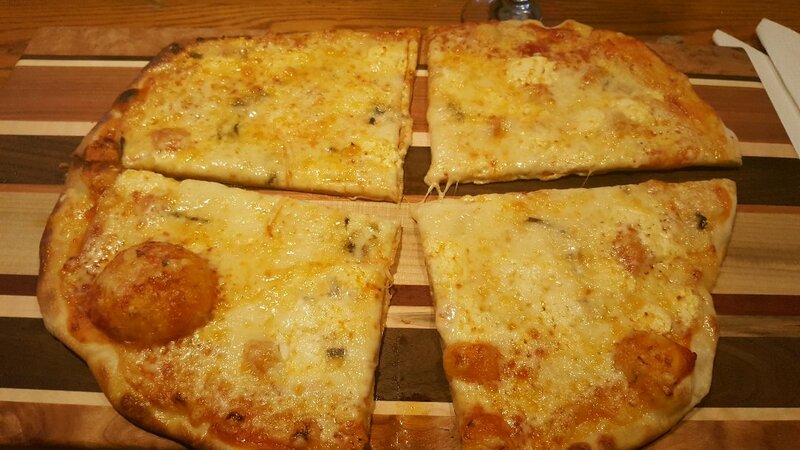 We, too, always have two pizzas, eat half and save the rest for the next day. Your huskies look like they're loving being outside. It was nice to see the full view of your back porch. Yes, it's small but such a cozy, secluded spot which is worth a lot. Got my copy of "The Cozy Life" in the mail yesterday. Can't wait to get into it. Thanks for turning me on to it! Wow the sun is out and you have birds and green stuff, all the snow men are dying away. The dogs are waiting for the day that they can dig a hole in dirt, that will make them happy. Oh you're welcome Mama Pea! Wait for a rainy day, get under a blanket with a warm cuppa or a wine glass :) and read all about Coziness! :) I think you'll find you already do so much in that book too. Everyone so far who I know has read that book and the Hygge book have said the same thing! I really liked it, I hope you do too! The pizza dough is really good, very easy to make. I notice I need more oil these days, not sure why, something to do with the humidity maybe? I add a slight dash more of water and a 1/4 tsp of oil to the normal recipe and it makes it easier to knead. But then during winter, I didn't need to do that. The pizzas look delicious. I still have home canned pizza sauce, so I may have to add that to the meal plan soon. Yum. Thanks Kristina :)) We're big pizza lovers around here. I have two pizza cookbooks. I try to make a traditional cheesy one and a different one to try out so that we always try something new. So far we stick to the classics though! Hi Rain! Holy!!! I am moving to your house. What a great meal - those pizzas look delicious! And the crackerjack....I need to make some of this! I hope the sun comes out and stays out for you to get rid of all the snow. We went from 19 on Saturday to -7 this morning. Yesterday was just nasty out. A strong north wind made for walking the dogs in a east to west direction :) I cried the whole way as my eyes do not like the wind and just tear right up whenever there is a slight wind. Tonight is bangers and sauerkraut. I love sauerkraut so any chance to eat it, I do! I need to make my own but my counters are filled with sprouting and kvass! Love your porch! Doesn't matter if its big or small, as long as you can be outside that's the best. 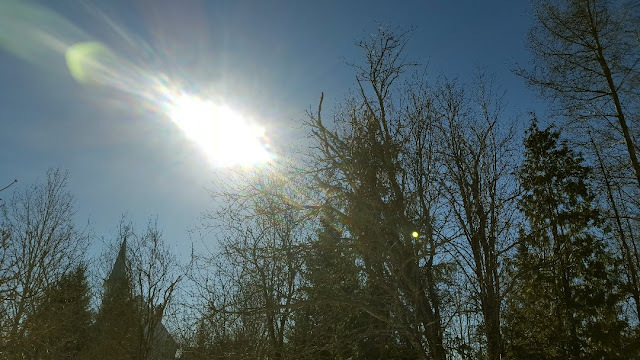 I told my husband on Saturday at about 10 a.m. that this winter we just had was very long. I am spending every minute I can outside until the weather tells me I cannot. And that's what I did Saturday but not yesterday. I tried but it was too chilly. Isn't it amazing how much better we all (including our doggies) feel with a little stretch of sun? Your pizzas look so delish - I wish I could come up with a thin, crispy crust that was GF. Still experimenting, but so far - no luck. I love your little porch - and we all know that "cosy" is best! Hi Dianna :)) Thank you! The pizzas were oh so good! :) The cracker jacks are great too, but they go fast! That's great that you barbecued! I love the smell of a charcoal barbecue so much, I can't wait to set ours up. 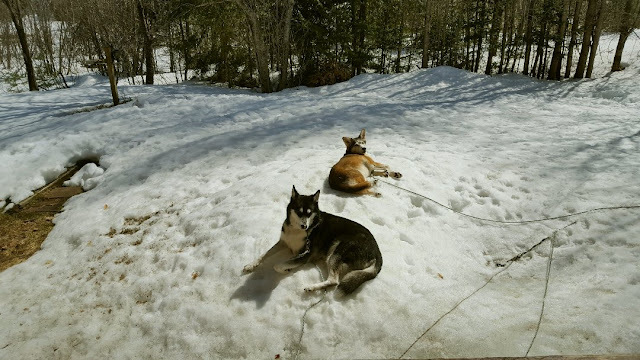 We did get sunshine afterall and I spent the entire time on my little porch, watching the dogs bury their bones, then digging them up again in the snow lol...it was a nice day! Thanks Nik :), the dinner was so good, and the porch is very cozy. I can't wait to get it all screened in. We're hoping to start that in about a week since I already saw some bugs out!